A Super-Capacitor, also known as an Ultra-Capacitor or an Electric Double Layer Capacitor, an energy-saving device that rapidly stores energy and supplies a substantial amount of current rapidly or continuously. Activated Carbon technology creates the characteristics that absorb or separates electric charges which are fundamental to the Supercapacitor. Since a supercapacitor has much lower internal resistance (ESR) compared to battery technology, it can supply greater output power. Also operating over wider temperature ranges with much longer lifetime(500,000+ cycles) than a battery. Supercapcitor is used for various applications ranging from electronic equipments that need quick charging and discharging to energy-saving applications in industries where a battery can be replaced with or used together with a supercapacitor. Here’s how to make a super capacitor. You can make these at home with aluminium foil and other materials found on the internet, it could be fun but not efficient or cost effective as the VINATech way. After 20 years of continual improvement and development, we fully understand the production process for mass production of the highest quality electric double layer capacitors. We would like to share with you today how we make supercapacitors at VINATech, the very best way to make supercapacitors in the world. There are basically 5 stages to make supercapacitors; Electrode, Winding, Drying, Sleeving, and Inspection & Test. Let’s start from the process of Electrode which is the core part of supercapacitor(EDLC). The characteristics of supercapacitors depend on the quality of Electrode. VINATech make high importance on producing the very best Electrode with it’s the very unique techniques. This guarantees the quality of our Electrode, following four key steps which include Mixing, Coating, Rolling and Pressing and followed by Slitting. Mixing is to make a ‘Slurry’ which is a liquid with viscosity, and Hy-cap supercapacitor by VINATech uses the very best activated carbon and materials to guarantee the quality. Coating is the process for coating Electrode on separators after Mixing process. Roll Press after Coating is the process with pressing the Coated Electrode and Aluminum foil with high temperature and pressure. Slitting process is to cut the Electrode into certain width, size by size, and its output will be ready for next assembly process. Following the Electrode production remove to another key stage, the Winding process which is important for supercapacitors to have supercapacitors shaped, and the previous steps before Winding then Striping and Stitching. VINATech uses the very latest automated process to ensure the very highest consistency. Striping secures space for lead terminals by stripping off very small part of coating electrode. Stitching is to fix lead terminals on the place where striping process is done, which polarize the shorter lead terminals into cathode and the longer lead into anode. Winding, the process of combining the anode and cathode electrode and separator together. After that, the supercapacitor can have a radial / cylinder shaped electric double layer capacitor. Thirdly, the next process is to control and reduce the impact of moisture caused by the external environment which can later work against the ultracapacitor. VINATech has four steps to reach the stage of perfection such as Vacuum dry, Sealing pad assembly, Electrolyte filling, and Curling. Drying process is in a vacuum oven for a selected time, which is proven to be most effective. Electrolyte filling is injecting electrolyte into assembled products. Aluminium can assembly process and Curling are the processes which follow, again using the latest automated processes, as developed by VINATech’s own technology base, sealing a electrolyte filling finished product in an aluminum case with rubber bung. Fourth, is the Sleeving, with heat shrinkable tube. And then the test and Inspection Check-up. With all above process work the VINATech ultracapacitor is ready to ship out to satisfy Customer needs. Thoroughly proved to be effective is the VINATech’s own technology based process, and it makes VINATech the world leading supercapacitor manufacturer and chosen by world best clients. Customers are the very reason for VINATech. We, VINATECH, always keep our eyes open with working on research and innovation to make world best supercapacitor. An EDLC(Electric Double Layer Capacitor) refers to two parallel layers of electric charges that are formed around an object interface with lot of holes and with special materials that produce electric statics. Electric Double Layer Capacitor stores energy by using Electric Double Layers where electric charges are combined together for charging and separated for discharging. Thus, it has little damage to an electrode, which allows it to last semi-permanently, and to charge and discharge quickly. Pseudo-Capacitor is an electrochemical supercapacitor where energy (pseudo capacitance) is generated through red ox reaction between an electrode and electrolyte. There are disadvantages of the Pseudo-Capacitor. Metal active material, its main raw material is expensive and its manufacturing process is difficult. Also, its ESR (Equivalent Series Resistance) is high. Q4.What is the Hybrid Capacitor? Basically, the hybrid capacitor is a combination of two different electrodes, one is EDLC electrode, and the other is Pseudo-Capacitor electrode. Therefore, this capacitor sustains both EDLC and Pseudo-capacitor characteristics. For example, an EDLC electrode in the Hybrid Capacitor has high density power and the other Pseudo-Capacitor electrode has high density capacitance (energy). Among its advantages, it is environmentally-friendly, and its energy density is higher than an EDLC. Also its charging and discharging is fast. VinaTech’s Hybrid Capacitor is also called P-EDLC. Q5.What are the terms used to refer to the characteristics of the supercapacitor? ‘Rated Voltage’ means the maximum voltage that can be applied continuously in standard( or normal) conditions without harming the component..
‘Max. Current’ means the maximum amount of current that can be supplied to equipment. 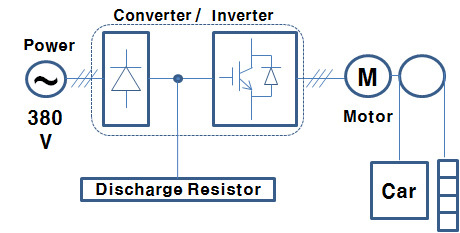 DC-ESR (Direct Current-Equivalent Series Resistance) means ESR value that is measured by repetitive charging and discharging in direct current setting. According to IEC62391 VINATech measures DC-ESR(Rd) by the following formula. ‘Leakage Current’ is current that leaks from the circuit where the current is supposed to flow. The current that leaks from a case or a point of earthing is also called the leakage current. ‘Energy density’ refers to the amount of energy stored in a set weight or a set volume. The term for this is Wh/kg or Wh/I. ‘Power Density’ refers to the amount of power that is generated from a set weight or a set volume. The term for this is W/kg or W/I. Hy-Cap is the brand name for the VINATech designed and manufactured super-capacitor. Q7.What approvals have Vinatech’s Hy-Cap acquired? Hy-Cap has acquired various quality approvals including UL, ISO/TS 16949, and ISO-14001. Also Hy-Cap complies with RoHS and WEEE. Q8.What are the characteristics of Hy-Cap? Using activated carbons, a natural material, our Hy-Cap is environmentally-friendly. It offers very high density power with super-low ESR (low internal resistance). VINATech are the first company in the world to develop 3.0V EDLC creating a 23% increase in power density compared to 2.7V Hy-Cap’s. Our hybrid type Hy-Cap offers twice the energy density of the standard EDLC range. By using PC (Propylene Carbonate) the P-EDLC operates in a wider temperature range than Batteries. The Hybrid technology has impressive power output and long life time, ideally suited to replacing low energy density battery technology. Vinatech has the largest production capacity of cylinder type capacitors focusing in the0.5F~1,000F range. Q9.What are the applications for Hy-Cap supercapacitors? Our Hy-Cap EDLC, with very low internal resistance(ESR), is ideally suited for back-up power applications that require strong current for short period of time or quick response, while our hybrid-type Hy-Cap, with double density capacitance compared to the standard EDLC is the right solution for back-up power demands requiring low current for long period of time in continuous mode. Regenerative Braking is an electric braking method that produces braking force by operating the motor as a power generator to convert kinetic energy to electric energy, which is also called, “Regenerative Braking Power.” In this system the turning resistance during the power generation can be used as braking force. Regenerative Braking is widely used in areas where the motor serves as the power source, e.g., elevators, electric locomotives, or ordinary vehicles. Q11.What are the principles of Regenerative Energy in elevators? Regenerative Energy in elevators consist of an all-in-one converter/inverter, car, discharge resistor and balance weight. Regenerative Energy in elevators generates the energy when the elevator goes up or down, according to weight difference between the car load and the balance weight. If the car load is heavier than the balance weight, Regenerative Energy is generated while the car moves down; if the former is lighter than the latter, the energy is generated while the car moves up. Q12.Why do we need a Super Capacitor in elevators? Even though a fire may take place at the same time as the blackout, the elevator carries passengers all the way to a safe floor and opens the door, by activating the Super Capacitor. 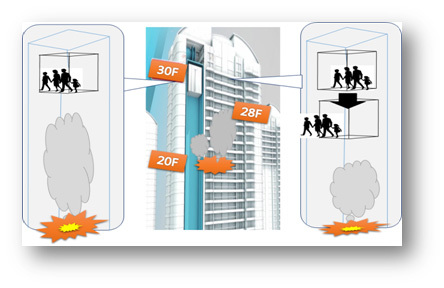 A Super Capacitor mounted in the elevator can reduce the cost of mobilizing firefighters in a door lockup incident. The following table is a summary of the number of firefighters’ mobilization from 2010 to 2013 in South Korea; here you can see that about 20,000 incidents take place each year. 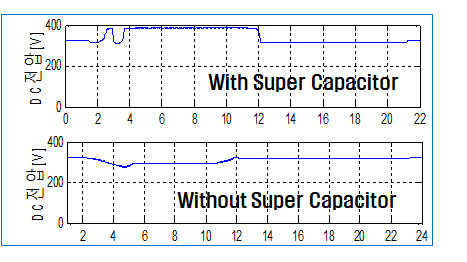 The below graph shows voltage variations in cases where Super Capacitor is or is not installed. Q13.How is Regenerative Braking applied to vehicles? Q14.How is Regenerative Braking applied to rolling stock? Q15.What is the cycle life of the Hy-Cap? The total cycle time for our Hy-Cap EDLC is 500,000~1,000,000, and the cycle time for Hybrid type Hy-Cap is 100,000. However, the working conditions such as temperature and voltage could affect the total cycle time.